The world’s best glazing machines take spray glazing techniques to a new level of quality. What else would you expect from Acrivarn? The most robust and sophisticated spray glazing equipment utilising spinning discs to ensure the perfect even finish for your products. Pastries and pies have never looked so good. 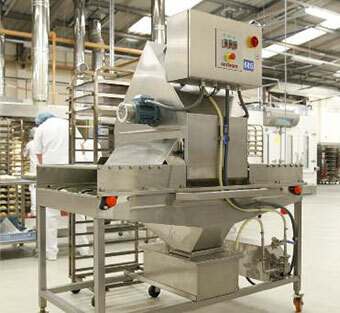 Spray glaze all bakery and pastry products using this free standing or production line machine from Acrivarn. The Acrivarn spray glazing machine features a variable speed conveyor which passes the trays or products to be coated underneath the atomising hood. Two spinning discs are used to guarantee an even glaze coverage and to disperse the coating liquid at a controlled rate. Excess glaze is filtered and returned to the reservoir within the machine to minimize wastage. Designed to spray liquids that need to be sprayed hot or require thinning by the use of heat, this machine is fully heated and has a thermostatically controlled reservoir. Designed to spray from above and below using a split conveyor belt, specifically designed for spraying preservatives, sorbates and mould inhibitors. 304 grade stainless steel is used throughout the glazing equipment. A conveyor trough is mounted on a framework of rectangular hollow sections, which supports the drive unit, pump and reservoir. Mounted above the conveyor is a hood housing the spinning discs. The pump is an all stainless steel hygienic type and can be stripped down for cleaning without tools. The conveyor belt speed is variable from approximately 5 to 30 feet per minute. Standard models are fitted with a heat resistant conveyor belt for products fed through the machine on trays.